My recovery time between my first big ride – LDN to Loughborough (and back) was only 5 nights. This time flew by and I was back at work and busy catching up. My body felt pretty destroyed and I needed to find quick ways to recover. A lot of food, water, resting and stretching, as well as a trip to see the fab Mark Hokan at Purus Active Health for a well-needed sports massage. My body was in pieces, so I was worried about a) the pain and b) the potential warning of my next ride. The good news is, he said my body had gone through a remarkable change in only 1 month and that apart from some to-be-expected muscle soreness, I was A-OK – phew! Thank you for the support Mark and for making me feel more human for my next big ride..
We set off early, around 7.30am after some porridge and lots of coffee. The weather looked to be OK, a bit overcast, slight wind, but dry. I confidently showed Kieron the route to Watford, having done this leg a few times now. The pace was good, faster than what I usually ride and we were averaging around 19km/h. It was great to be able to chat with someone else and share the experience and as a result, time flew by! Part of the route took us down some canal paths, which just got muddier and muddier and slowed us down. We then decided to head onto the roads, but consequently hit a lot of undulating hills, one after the other. In total, we climbed a staggering 1,731m of elevation, that is almost 3 times up (and down) The Shard. I was enjoying the pace but also tiring a bit quicker than usual, that paired with the hills made the final few hours tough for me. Kieron lives in Sheffield, cycles a lot (as well as blogs about it, read his blog here) so is used to hill riding. Me on the other hand – I still have some adjusting to do! Once we got to our hotel, we were surprised to meet my husband, Adam Stones! What a lovely surprise, after having not seen him for almost 6 weeks, it was wonderful to catch up and share our cycle stories with someone else. Adam’s mum, Bev and her partner Mick, came and joined us for a celebratory drink, or two – just bliss. 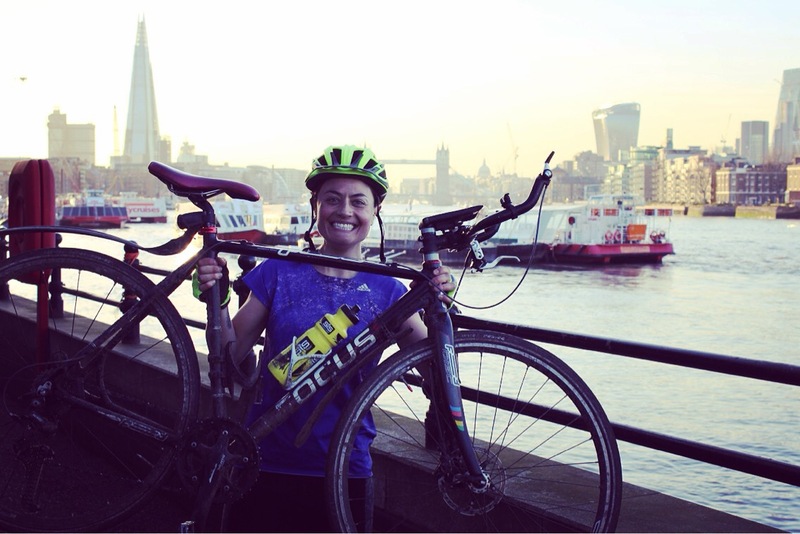 Read Kieron’s blog post about day 1 of riding – Mud, Sweat and Beers – Day 1 London to Northampton. After an early night and a comatose sleep, we were the first ones up for breakfast. We ate our breakfast in anticipation, whilst listening to the rain clatter down on the windows. All I wanted to do was eat and eat, drink lots of coffee and go back to bed. Having my husband there and knowing Kieron was cycling with me for the whole journey, gave me the strength to put on my wet weather gear and get back on the bike! We set off into the overcast and wet sky and headed for the Brampton Valley Way, a long stretch of off road from Northampton to Market Harborough that follows an old railway line and passes through Pitsford and Brampton station and since closing over 30 years ago, has stayed exactly as it was and kept its old fashioned charm. I was nice to not have to battle with motorists straight away, I was tired and a bit wobbly, so the calmness of cycling along a track, through greenery helped me settle into the ride a little better. That said, it was a tough track, very bumpy with lots of rocks and branches to contend with, and seriously, seriously, muddy! It wasn’t long before we hit the first tunnel – WTF? Yes, a tunnel. We should have guessed but didn’t know how long the old railway line was. At first, it just looked like, well, a tunnel. So I ignored the signs outside and started cycling through it. Within seconds I was plunged into darkness. I couldn’t tell which way was up or down. I was so grateful to have someone else with me! Kieron wasn’t phased, chucked on some lights (he had positioned them on his bag for easy access. Smart, me on the other hand, had them deep inside my huge backpack) and carried on cycling. I just thought, sod this, got off my bike and walked! It was scary, gruelling, seemed to take forever (it’s 0.5km long) but also exciting and interesting. And at the very least, we were heading toward a tiny circle of light ahead, knowing there was at least a way out. I had to not think of films like the Grudge and just think happy thoughts! Once we were out, we were just laughing and trying to figure it all out. Another 10km on and we approach another tunnel, but this time we knew what to expect and just went for it. Just past the quiet market town of Market Harborough we were back on the roads. It wasn’t long before we were on quieter roads again, winding our way through middle England. We passed through Leicester and then Loughborough, where we stopped at a service station for a quick break. Prior to us stopping, we had cycled for about 6 miles down a very busy A road. At this point, it was chucking it down and the spray from the bikes and the busy cars was getting us obliterated. I remember looking at Kieron thinking I must be covered in mud and he was looking at me thinking, he must be fine (remarkably my face had no mud on it!). At the service station, someone pointed out to Kieron his face was entirely covered in mud! I mean, it was funny, but also neither of us gave a crap! We tried to clear up a bit and dry off and chucked some food and drink down us pronto. Nottingham was a sweet 20km away and well within our reach. Moving on, we cycled down some lovely quiet farm roads, sort of parallel with this giant power station. As we were nearing Nottingham, it got hillier and hillier. At this point, my knee began to get really sore, so sore I was crying whilst cycling. Kieron was ace and tried where he could to cycle next to me uphill and push me along! With about 2km to go, I was just ecstatic. I also knew my husband was waiting for me at the hotel, even better! We arrived, wet, tired, covered in mud and slightly mentally scarred from the tunnels, but – WE DID IT. Adam was waiting in the room with food and a bottle of Prosecco. I don’t think I’ve ever drunk Prosecco that quickly before and within minutes I was all over the shop! Kieron stayed with us for about half an hour, had some coffee and food and got back on his bike to complete the final leg of his journey back to his home town of Sheffield. I had no idea how he got back on that bike, but he did and 4 hours and another 60km later later he arrived safe and sound! Read Kieron’s Day 2 blog post – Mud, Sweat and Beers – Day 2 Northampton to Sheffield (via Nottingham). At the CSPN Convention itself, I received a warm welcome. Lee Mason, the CEO of CSPN did a shout out about me cycling to the convention and consequently, a lot of delegates came up to talk to me about Powered by Me and find out more! It made me feel extremely proud of what I had done so far and confirmed some of the reasons as to why I was doing it! The second day of the convention, I snuck off a little early (I had 100km to cycle after all) and was thankful to have good weather. I felt OK, a little rested after having not cycled at all the day before and was ready for it! I was heading for the Hopping Hare in Northampton, where Kieron me and Adam stayed on our way up to Nottingham. I felt strong, confident and able. I cycled through Loughborough (my old University) and stopped off for a quick toilet break in the Pure Gym. I also decided to drop into Halfords to get some bike oil. My chain was crunching and I was terrified it would snap. A bit further south, I cycled through Leicester, past Leicester Square (but not the Leicester Sq I know!) and also past this weird looking bubble building, which looked like a massive grub or cacoon and was the National Space Centre. Have always been interested in visiting, so might decide to stop off one day. Doing the same route Kieron and I had done a few days before, I knew the final few hours would take me on the Brampton Valley Way and through those tunnels! I made a decision that if, for whatever reason I didn’t have a lot of day light by the time I reached Market Harborough, that I would find a road route instead. Thankfully, I made good time and was hitting the Brampton Valley Way at around 4pm. I had 2 hours left of daylight, so only a puncture or an injury would hold me back. Two tunnels later, no punctures, feeling tired but OK, I get to my hotel! I was dry, relatively warm and not scarred from the tunnels (which I was so proud I did on my own – well, I had to)! I had a long shower, some snacks and headed down to the bar for a beer and sone dinner. It wasn’t long before I hit the sack, to get as much rest as I could for the longest leg and final day of riding the following day. After some rest and a good breakfast, I set off at about 7.30am for the last day of riding. Knowing I was going to be home that day and that I had good weather ahead, I felt able, confident and up to the day! I made sure I paced myself, as I knew it was a full day of riding. After getting out of Northampton and nearer Milton Keynes, I must have climbed higher, as it became really cold, misty and foggy. I struggled to see ahead, so put all the lights on I had to make sure cars could see me. A few hours in, the weather became clearer and it was the perfect temperature, little wind and continuous blue sky. It wasn’t long before several hours had passed and I had already cycled over half way. I felt happy, strong, confident and was enjoying it! At around 80km in, I stopped off at the Fred and Ginger in Berkhamsted for lunch. Some pasta, cake and two coffees later, I was ready to do my final 50km. Time and weather was on my side, so I had nothing to loose. A few hours in and I was approaching recognisable parts of London – Mill Hill, Edgware and just couldn’t wait to see a London bus! Once at Maida Vale I knew I was so close. Another hour later and I was cycling along the super cycle highway alongside the Thames. The sun was shining, I still had the evening ahead and I was so, so happy to see the familiar Shard, which meant I was minutes away from home! I got home at about 5pm, with a beaming smile on my face and my husband to greet me, immediately followed by some celebratory snaps – it was good to be back! IF YOU’RE INSPIRED BY MY POWERED BY ME ADVENTURE, PLEASE LIKE, COMMENT, SHARE AND DONATE TO MY CHOSEN CHARITY FOR MARCH, LONDON WILDLIFE TRUST, JUST CLICK TO DONATE BELOW, OR TEXT PBME93 TO 70070 TO GIVE JUST £5. Next Powered by You: who’s doing what?